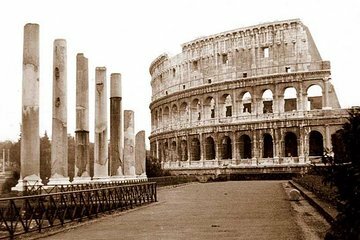 Retroceda 2.000 años hasta el momento en que Roma gobernaba una gran franja del planeta y el centro de entretenimiento era el Coliseo. Esta visita guiada a pie no solo ofrece entretenidos e intrigantes cuentos y detalles históricos mientras se pasea por el Coliseo y el Foro Romano, sino que también le permite acceder a través de la línea. Así es: pase por la larga cola y explore el imponente Coliseo, el Foro y la colina Palatina. Aprende cómo se construyó el Coliseo y sobre la vida cotidiana en el Foro Romano. Tour privado significa que recibirás mucha atención personalizada por parte del guía. Navegar y comprender el Coliseo grande y muy concurrido es mucho más fácil con un guía privado. Our tour guide, Maria, was super! We were very delayed getting out of the airport so we were late for the tour. Maria was very patient in meeting up with us and made sure we saw as much as possible in the time that we had. She was very knowledgeable, as well as funny, which is good with kids. She kept us moving and helped us take great pictures. We all enjoyed the tour. We had the opportunity to have Amanda as a guide. With her guidance we successfully negotiated the crowds and bureaucracy of tickets and security to enter the Colosseum and the forum with ease and minimal trouble. Her explanations were comprehensive and well thought out. She could adjust her guidance to our level of understanding in areas we knew well, and other we did not.Outstanding. A private tour guide is the only way to really learn about the Colesseum and the surrounding ruins. Our guide was extremely knowledge. We enjoyed our tour very much. We loved this private tour for 4 of us. Skipping the line is the way to go as the lines were very long. Our guide was extremely knowledge and added many fun facts which made the tour awesome. Highly recommend this tour!! Absolutely incredible experience with probably one of the most experienced guides we have had the pleasure to meet, a massive thank you to Ferdinando for sharing his amazing knowledge and ability to bring and visualise this breathtaking historic monument. We have as to date never have had a bad tour courtesy of viator and always recommend them. Excellent, engaging and knowledgeable guide. Our well informed and thoughtful guide Paulo was a master at opening spaces in the crowd for our group of 4 to see this magnificent structure. He knew the best vantage points, a lot of interesting facts and was an enjoyable narrator of the history of the people who lived at the time the Colosseum was used. We thoroughly loved our private tour of the Colosseum and Ancient Rome. Our tour guide Michaela was informative and helpful. She had great info and was always willing to answer our questions. My wife and I felt fortunate to have a small, private tour when we saw so many large groups all around us. For us it was worth the extra money to have a one-on-one experience with a guide as opposed to the alternative.